I was attracted to this trilogy by the fabulous covers, and on reading the sample of book one was hooked. I don’t read much YA, but sometimes books in that genre have an appeal to all ages and this is one of them. There’s romance here, but as befits the genre its very “clean” romance, no more than heated kisses. Its been a fun read, I’d had books one and two for review and though the request for this one was pending I actually bought it, wanting to know how the story ended and being too impatient to wait for request approval….that’s me, want everything yesterday. Anyway that was a few weeks back, now I’ve got it for review I’ve re read this one to have a fresh mind ready to write. Well, the girls have thinned down to just four. There’s still some bitchiness, a lot of unease between them knowing that only one can be chosen, but they find ways to get along encouraged by the Queen. 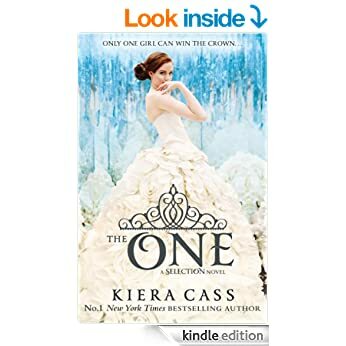 America knows Maxon likes her, she’s fallen in love with him but won’t come out and say it before he does, in case he doesn’t and choses someone else. Maxon loves her but won’t say so, wanting her to choose him first – real catch 22 situation. He’s still dating and kissing the other girls, keeping his options open in case America doesn’t want him, and she’s jealous of course. Its a dilemma that can only end if one of them makes the decision to speak first. Alongside that there’s still trouble from both rebel factions, and of course America still says and does things that upset the King. He Really doesn’t like her but her popularity with the public means he can’t just get rid of her. He tries therefore to make things very difficult and to show her in a bad light as much as he can, ensuring she gets the most difficult tasks, ones that go against her principles. Its an action packed ending to the trilogy, lots going on, lots of secrets and discoveries. I kind of understand both America’s and Maxon’s views but feel he’s in the more difficult position – if he tells America he loves her and she doesn’t want him, the one he does then chose will always feel second best, and that’s not a good way to start a marriage, whereas all she need do is leave. She has a choice and really he doesn’t. There’s some real drama here and at the end some heart-breaking things happen, and just when it looks like it’s finally worked out for them something comes out that throws it all up in the air. Its been an easy to read, fun story and I enjoyed it. Its not one I’d read over and over, but at some point I may well go through all of them again. Sometimes all I want is a light, fun read with a HEA. Stars: Five, its not grand literature but a fun, easy to read story. Good Time Bad Boy, Sonya Clark. I adore Sonya’s Paranormal reads, Red House/Mojo Queen and the Magic Born series, and wondered how I get on with her contemporary novels. 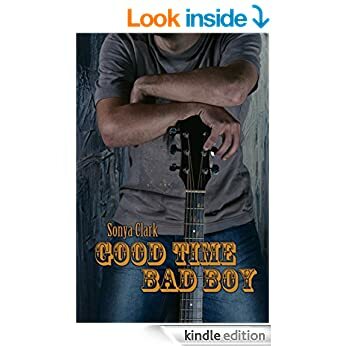 I do love this Deep South gentle type romance, and found that its clearly a style that works well for Sonya, producing a story that I very much enjoyed. Coming from the rainy UK, where even now on Jun 20, just the day before midsummer its still cool, with the sun being very shy, and rain creeping in all too often. Outdoor events here are always planned with caution, so to read of a place where the sun seems to shine constantly, and the evenings are long and warm is such a treat….I kind of sit myself mentally in the background and watch. So, we’ve Wade – who at first meet seems to be a typical arrogant, washed up ex star, living on his glory days. He’s gone on stage and got drunk once too many times and now his agent can’t get him work, and she’s told him to go home and sort himself out. He’s not really got much family support there though, in the small town where everyone has heard the stories, where his brother is the local cop and hates him, where his parents live and seems to judge him. Then there’s Daisy, who struggled being brought up as one of three kids to single mum Alice, who’s coped by drink, drugs and a procession of men. Daisy’s childhood was food banks, evictions and shabby clothes. Daisy’s sister is now a single parent, though far better and responsible than their mum, their brother is a local pothead dealer. Daisy wants more so she’s working as a waitress while paying her way slowly through school. I love Daisy, she’s open and genuine and just wants what so many take for granted, a nice home and security, and she’s learned that the only person to provide it is herself! A run in with Wade though now he’s home results in her getting sacked. Wade is mortified once he’s sober and finds out what happened, and persuades the bar owner. a long time friend and the man who gave Wade his start playing there, to give her the job back, but he’s caught in a tough bargain – he has to play there weekends through the summer. Thrown together Daisy and Wade become friends, and then slowly get closer. They’re each holding secrets though, each marking time and they both set out to enjoy just a summer fling. It becomes more though they don’t want to admit it to themselves at first, but still at the end of the summer Wade will go, and Daisy can’t/won’t do long distance relationships. I so felt for her – she knows if she asked Wade to stay he probably would, but that long term he’d resent it, and knows her heart will break once he’s gone. So the summer goes on, they have a steamy, sensual romance, and then decision making time comes. I could feel that tension building up especially in the last third of the story, and was wondering how on earth Sonya was going to work things out for them. To me in a good novel the people feel real, and I care for them, want a HEA for them, and I couldn’t see how it was going to work out for a long time. The only reason this isn’t a five star from me is my love of the downside, the sad drama part, which was here but was over a little too quickly for me. I like that to be drawn out, over days or even weeks and then when it comes together it seems so much sweeter. It was well done here, but everything resolved just a little too quickly for me hence the half star drop. Stars: Four and a half, a fun summer read that feels very real.